SAN ANTONIO, Texas – Two in the coaching profession were honored for their long service and dedication to the U.S. Track & Field and Cross Country Coaches Association (USTFCCCA) at the organization’s convention this week at the JW Marriot Hill Country in San Antonio, Texas. Former Indiana coach Sam Bell was honored with the George Dales Award while former Emporia State coach Dave Harris was presented with the Jimmy Carnes Distinguished Service Award. Sam Bell, a former coach at Oregon State, California, and Indiana, was presented with the George Dales Award. Bell served his fellow coaches as President of the United States Track Coaches Association (USTCA) from 1997-2002. He previously served as President of the Division I Track Coaches Association from 1979-80. He was also one of the driving forces behind the creation of the Athletics Congress, which replaced the AAU as the governing body of track & field in the U.S. In addition to a successful 40-year coaching career in the college ranks, he enjoyed a fruitful international coaching career. He served as an assistant coach for the 1976 U.S. Olympic team, and he was head coach of the 1979 U.S. World Cup team. The George Dales Award is named in honor of longtime Western Michigan coach George Dales for his relentless pursuit in the growth and development of track and field and cross country over more than half a century. This award is presented annually by the USTFCCCA to a distinguished individual who, through their efforts, has enhanced the profession of coaching track and field and cross country. Former Division II Executive Council Chairman Dave Harris was presented with the Jimmy Carnes Distinguished Service Award. 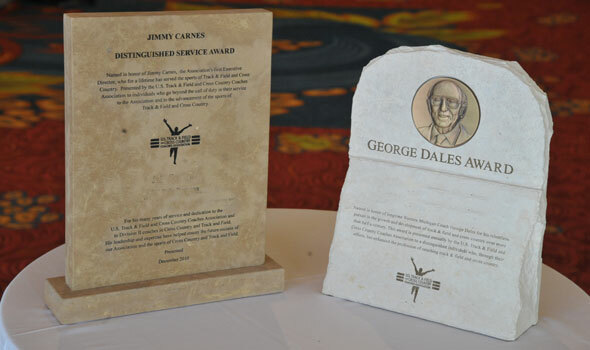 The USTFCCCA’s Jimmy Carnes Distinguished Service Award is presented to individuals who have gone above and beyond the call of duty in their service to the Association and to the sports of Cross Country and Track and Field. Harris served in a number of leadership positions within the USTFCCCA, including President, 1st Vice President, and 2nd Vice President of Division II Track & Field. He was the first non-Division I President of the USTFCCCA, serving in the role during the years of 2005 and 2006 and leading the Association through its reorganization in 2005. When Division II coaches within the USTFCCCA looked to reorganize by forming an Executive Council, he was a natural choice as the group’s first Chairman. Dave served in that role from 2009-2010. Harris recently became the Head Cross Country Coach at the University of Nebraska after serving as the Head Cross Country and Track and Field Coach at Emporia State University for nearly 20 years. Harris continues to serve the USTFCCCA as chair of the Hall of Fame Committee.